Mark Aronson grew up hiking the hill prairies of his hometown, Dubuque, Iowa. He did his undergraduate work in Zoology at the University of Iowa and graduate work in Zoology/Ecology at the University of Montana. His primary interests are in ecology, aquatic ecology, conservation biology and comparative animal physiology. His academic mentors include some of the world's leading ecologists. During his undergraduate training he worked with Stephen P. Hubbell, a tropical and theoretical ecologist known for the Unified Neutral Theory of Biodiversity. During his graduate work he was a research assistant for Andrew Sheldon, stream ecologist and stoneflie expert. His thesis work on rainbow trout was done in the lab of Dr. Fred Allendorf. Allendorf is one of the world's leading salmonid population geneticists. Aronson joined the faculty of Scott Community College in 1985 as a member of the Biology Department. His teaching assignments have included: Human Anatomy and Physiology I & II, Neuroanatomy, Biology II and General Zoology. He offered the first online Environmental Science and Conservation Biology courses in the state of Iowa as part of the Iowa Community College Online Consortium (ICCOC). He has served as a fellow for the Advanced Technology Environmental Education Center (ATEEC) working on curriculum in environmental education for many years. In 1988 he formed the Scott Community College Environmental Club. The SCC Environmental Club has become one of the most active and recognized grassroots student environmental organizations in the state of Iowa. Many club members have gone on to take important environmental and management positions. In 2004, Mark was honored by the Iowa Association of Naturalists with the Bohumil Shimek Environmental Educator Award. This award is given to the most outstanding environmental educator in the state of Iowa for that year. He was cited for his outstanding student programs and teaching about the natural history of Iowa. One of those programs was the Activism for the Land Program. This program provides opportunities for Environmental Science students to volunteer with nonprofit environmental organizations. Conservation Biology students also work on the Corridor Education Project. This is an effort to preserve a linkage zone/corridor bisected by an interstate highway in western Montana and Idaho used by grizzly bears, cougars and wolves. The American College Testing Service asked Aronson to write and edit material for the national ACT Science Reasoning Exam and Collegiate Assessment of Academic Proficiency Exam (CAAP) in the areas of biology and physical science. He is also a consultant in Environmental Science for Jones and Bartlett publishers and has edited or authored a number of their educational materials. He authored a chapter in Prentice Hall's Environmental Technology Series, Volume VI, on Electroplating Waste Streams. Mark has been active in the wilderness education movement. He has worked with Andrea and Doug Peacock. Doug Peacock is a Guggenheim Award recipient in environmental writing well known for his protection of wilderness. The Peacock's have been instrumental in their efforts to protect wilderness both through their journalism and activism. 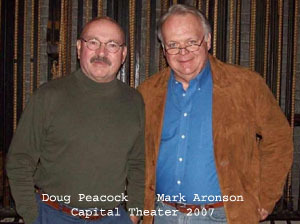 Mark has offered wilderness workshops in Yellowstone National Park and other locations with Doug Peacock. Mark has also worked on Native American issues and wilderness courses with the Crow tribal elder and oral historian, Howard Boggess. Boggess is known for his efforts to save sacred tribal lands from development. Howard continues his historical research with a number of organizations including: the National Park Service, State of Montana and Bureau of Land Management (BLM).